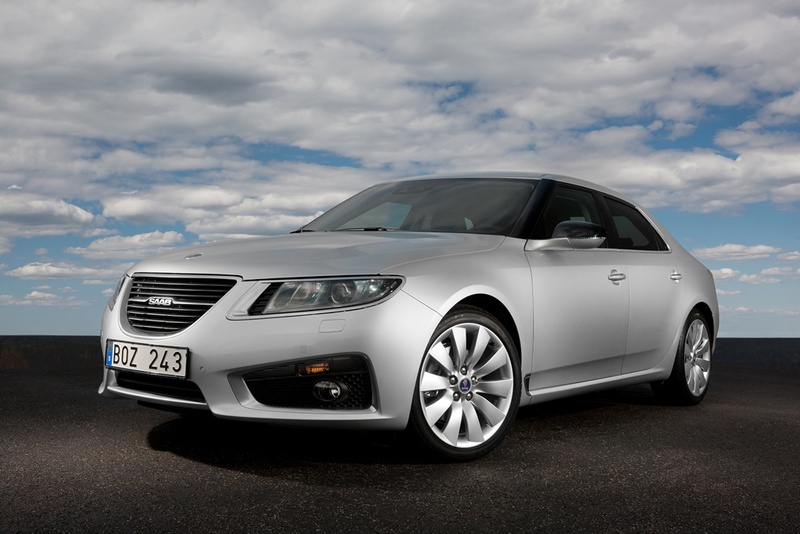 Born and bred in Scandinavia, the all new Saab 9-5 Sedan is a sleek expression of the power of simplicity and heralds the arrival of a new, more assertive design language for the brand. The ‘words’ in the new vocabulary come from Saab’s award-winning Aero X concept car, revealed in 2006 as a signpost to the future of Saab design. Its bold front-end styling, ‘wraparound’ window graphic, clean body surfacing and ice-block lighting themes are key visual elements now translated into the powerful form of the new 9-5 Sedan. They reflect a brand inspired by Scandinavian design and a unique aircraft heritage. The face of the new 9-5 is defined by a deep grille flanked by curving, ‘ice-block’ headlamp units with signature LED light guides. The windshield and side windows are presented as a single wraparound graphic, the disguised front and side pillars giving the glasshouse of the cabin Saab’s signature cockpit look. The proportions of the windshield and roof are also reminiscent of the ‘peaked cap’ look of the classic 900 model. And that large Saab logo, embossed in the center of the grille, characterizes the more assertive, self-confident design language. The ‘organic sculpture’ of the low-slung body blends clean convex and concave surfaces with natural, curvaceous forms. 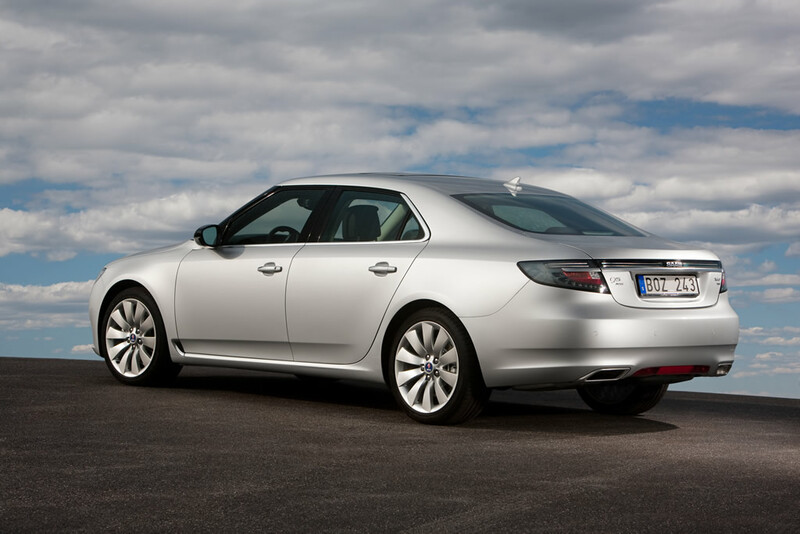 Seeming shaped by the wind, the bodywork has a smooth, fuselage-like quality inspired by Saab’s aircraft heritage. Fenders stretched to the outer edges of the wheels, 17 to 19-inches in size, energize the looks of the car and add to its dynamic, purposeful stance. Saab brand design cues can be seen in the ‘hockey stick’ belt-line, underlined by a simple matt aluminum trim, leading into the strong rear C-pillars. The car’s dynamic character is underlined by a falling roof-line and those strong, sweeping rear pillars which buttress a slightly recessed rear screen. The flow of the roof and pillars culminates in a smooth, flat rear deck with an integrated spoiler in the trailing edge. A full-width ice-block rear light bar, echoing the front light theme, adds to the new 9-5’s Scandinavian character. The sleek shape also contributes to excellent aerodynamic properties. An impressive 0.28 Cd (coefficient of drag) contributes to reduced fuel consumption and low wind noise. Good high speed stability is also ensured by near zero lift forces at the front axle and the achievement of negative, downforce values at the rear, assisted by airflow from the slightly concave surface of the trunk lid. The rear light moldings are also shaped with small side ‘spoilers’ to further improve rear stability. Top-of-the-line Aero variants are visually distinguished by unique front and rear bumper moldings, 19-inch ‘turbine’ alloy wheels, front fog lamps, a lowered sport chassis, bi-xenon headlamps and twin exhaust tailpipes integrated into the rear bumper fascia. The new 9-5’s spacious cabin is characterized by simple forms that echo the clean lines of the exterior. The choice of materials, the fit and finish and the tactile quality of the controls all reflect the new 9-5’s premium appeal. A wheelbase longer than that of its predecessor has enabled a substantial 58 mm increase in rear legroom, which exceeds that offered by all main competitors. Front legroom is also up by 11 mm. The driver-focused cockpit is traditional Saab, while its execution is all new. A deep center console sweeps up around the driver into the main instrument display. It is a new expression of Saab’s signature cockpit layout, first introduced on the Saab 9000 model and continued with the current 9-5. The console is now inclined at a much shallower angle, improving driver ergonomics in the operation of its functions and in viewing the display screen. The deeply recessed main dials include a driver-selectable, rolling ‘altimeter’ speed read-out, a reference to Saab’s aviation heritage from the Aero X concept. The needles of the dials, the main display screen and the optional HUD in the windshield, are all illuminated in signature Saab green. The ‘Night Panel’ button, another unique Saab feature, allows the driver to minimize distraction during night driving by switching off all the main instrument illumination, except the speedometer. Another subtle detail are the small channels in the center stack fascia that link the main infotainment and climate controls. They resemble the shape of Leonardo da Vinci’s Vitruvian Man, a hint at the combination of human design and scientific precision deployed in the layout of the cabin. It’s part of the logical, zonal groupings used for the location of the car’s interior, chassis and lighting controls. The removal of a mechanical handbrake linkage frees up space for a large, two compartment center console, with twin cup-holders and the potential to connect several portable devices through USB and AUX connections alongside a 12V power outlet. A useful pull-out storage drawer next to the driver’s door is big enough to take a number of personal items, such as a wallet, PDA and glasses. The rear of the cabin provides comfortable accommodation for three adults. Apart from more leg room, it now offers the option of rear seat entertainment via fold-out screens in the front seatbacks and separate rear climate control. The 60/40 split, folding seatback includes an arm-rest with twin cup-holders, a storage compartment and a load-through ‘ski hatch’. The trunk features convenient bag holder hooks on each side, an umbrella holder and a storage compartment in each sidewall. The optional, U-shaped track in the floor carries a telescopic cargo divider which can keep a wide range of different sized items in place. Linear, Vector and Aero variants are each distinguished by a unique cabin ambience, including decor trim applied to the main instrument panel, center console and behind the door grab handles. In Linear specification, the upper/lower instrument panel, door cappings and decor trim are in Jet Black, with a choice of Jet Black or Parchment fabric seat upholstery, complemented by door inserts and armrests in a light or dark color. Vector adds a choice of Shark Grey with Jet Black, or Dark Cocoa with Parchment for the instrument panel and doors, and the decor trim has a brushed metal look. The seats are upholstered with leather bolsters and fabric inserts in Jet Black, Parchment or Shark Grey. Top-of-the-line Aero adds a sporty, all-leather interior. The front fascia and door trims are in Jet Black with dark, bushed metal, titanium-like decor trim. The sculptured, perforated leather sports seats are offered in the same colors as Vector. Vector adds front seat squab storage pouches, steering wheel audio and cruise controls, an adjustable front arm-rest, cruise control, ambient interior lighting, a USB connection and a graphic information display. Aero adds powered and heated front seats, with an extending under-thigh support. The interior is further distinguished by a full color information display, an ‘Aero’ embossed, flat-bottomed sports steering wheel and sports aluminum foot pedals.